This entry was posted on January 6, 2015 by Tinteán Editorial Team/EMcK, in History, News and tagged Eureka. James Lalor, Lalor Chieftain Margaret Coogan, Peter Lalor. Bookmark the permalink. The art world has woven another physical link between Ireland and Australia. At the recent James Fintan Lalor School in County Laois, prominent Irish artist, Brendon Deacy exhibited his latest oil on canvas collection – ‘Siorai – Visualizing the Words of James Fintan Lalor’. It was an outstanding success as it set the perfect backdrop for the school’s forums of debate about the social and political scene in Ireland today. At the 160th Anniversary celebrations of the Eureka Stockade at Ballarat, the International Lalor Chieftain, Margot Coogan, presented a limited edition print of one of Deacy’s paintings to the Museum of Australian Democracy at Eureka, Ballarat. The print is a portrait of the Irish Rebel, James Fintan Lalor, incorporating Lalor’s famous line ‘Ireland Her Own and all therein from Sod to the Sky.’ It will hang in the museum’s gallery next to a portrait of Fintan’s brother, Peter Lalor. Margot Coogan, who is committed to promoting the Irish-Australian connection during her chieftainship, believes that this portrait, displayed in this important Australian place, will be a further nexus demonstrating the joint struggle for democracy in the two countries. The James Fintan Lalor School has become a major cultural and social issues forum in County Laois and next year the theme of the school’s weekend will be Peter Lalor and Eureka. Following the Lalor Chieftain’s presentation to the Museum of Australian Democracy at Eureka, there has been significant interest in bringing the 10 piece collection of Brendon Deacy’s ‘Siorai’ to Australia. Brendon Deacy said that while researching this project he learned that Fintan Lalor contributed immensely to the Irish political landscape but what struck him the most was that the words of Lalor in the 1800’s are still as vital to Irish society today as in the past. Rather than repeating previous processes that I have used, I felt that this project needed an original approach so to emphasise the contemporary relevance of Lalor’s statements I decided to use his words verbatim; treat them in the style of Irish political posters of his time; and juxtapose them with images of present day Ireland. While in Ballarat, Margot Coogan installed the new Leader of ‘Lalors Australia’, Peter Lalor Philp. 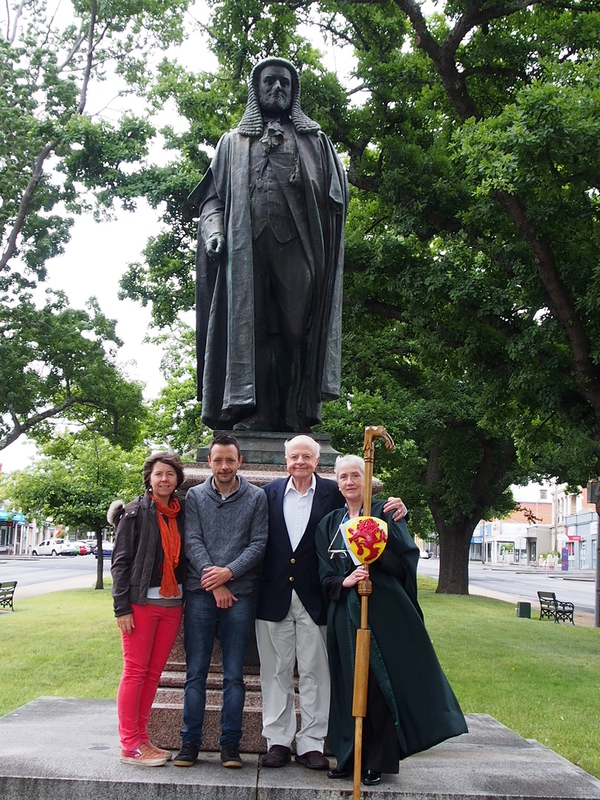 The ceremony was conducted beneath of the statue of Peter Lalor in Sturt St. The installation featured the Lalor Blessing and Chieftain’s call for a commitment from the new Leader to stand true to the Lalor motto ‘Strong and Faithful’. Peter is the new Leader of ‘Lalors Australia’.